Is it time to paint that dirty garage floor? Having Kwekel Services, LLC paint your garage floor with a high quality epoxy garage flooring will provide you with a durable surface that is stain resistant, easy to maintain and attractive. Kwekel Services, LLC specializes in garage floor painting and epoxy applications. Give us a call today at (844) 288-9114 to find out how reasonably priced our garage floor painting service can be. Kwekel Services, LLC uses a high grade epoxy that will provide complete coverage over your concrete flooring and hold up to the wear and tear of vehicles, toys and foot traffic, without chipping or pealing. We use products that are made to last and are easy to maintain for years to come. Call (844) 288-9114 today to arrange for a free quote. 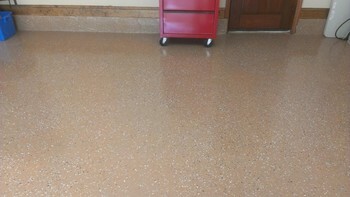 You'll be surprised at how quickly and cost-effectively you can resurface your garage floors. You expect a garage floor painting service that will answer the phone when you call and be available to answer questions. One who will arrive on time to scheduled appointments and complete jobs in a timely fashion. We at Kwekel Services, LLC take great pride in being that garage floor painting service. We'll work within your schedule and closely watch the weather to find the most ideal times to complete your garage floor painting job. No job is complete without our customers' seal of approval. We're confident you'll be thrilled with your freshly painted garage floor. The Garage Painting experts at Kwekel Services, LLC have undergone extensive training in the properties of garage floor epoxy products and their application. When applied correctly, the coating will last for many years and hold up to frequent usage. Don't subject yourself to working with these caustic chemicals. Our garage painting crew is trained in the safe use of garage floor epoxy. In addition, timing is critical. The flooring must be thoroughly dried between each step in the process, from cleaning and stain removal to filling in cracks and finally priming and painting your garage floor. Kwekel Services, LLC garage floor painters have the patience to see the job through and not rush the process. The result is a beautiful, durable garage floor that will be the envy of the neighborhood.